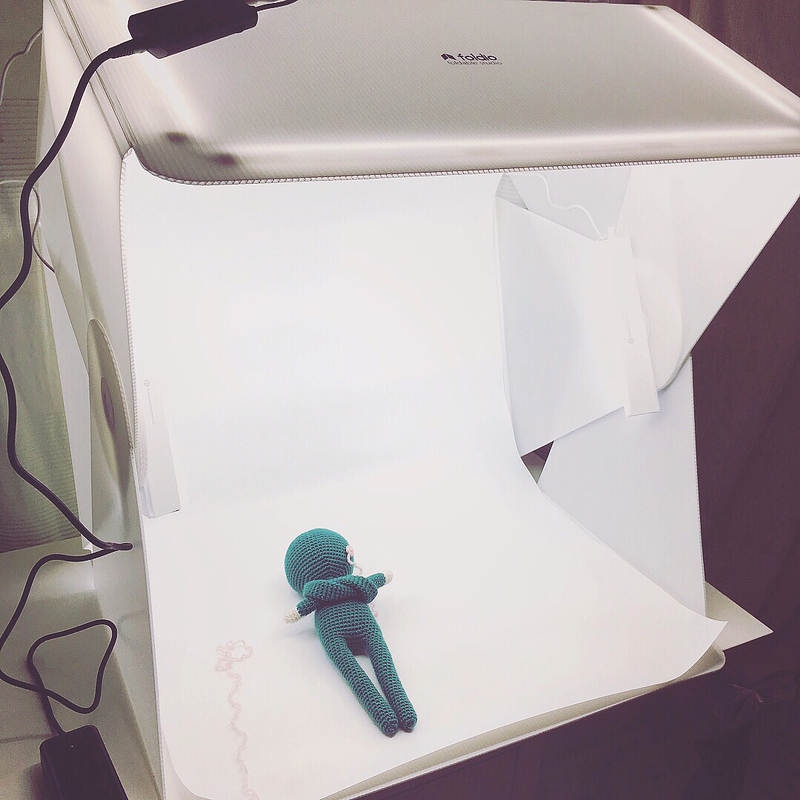 A new portable photostudio for my art & craft + NONOs pattern giveaway! Those of you who are following me for a while now know already that I am working with the most lousy equipment you can find on this planet to design my crochet patterns. There is no real lighting setup, photos and videos are recorded with my old cellphone camera, and the little sunlight in winter gives me a daily timeframe of 2-3 hours max to take pictures in my little craft studio, which is the only room in the house hit by sunlight from 2 sides. Since my pattern sales have been slowly increasing the last months, I was already able to invest in a better tripod, an LED lighting system, and some backdrops. But still I have to work for hours on correcting these pictures taken, so they will be bright and sharp and good enough for the printable Pdf patterns in my Etsy and my Ravelry shop. BUT THIS WILL ALL CHANGE NOW, AND YOU MADE IT HAPPEN! Right before christmas 2017 I announced that I will have to close my pattern shops for a few months, to finally take care of all the food allergies that had been haunting me for months, some even for years. Then something wonderful happened. So many of you showed their support by buying all my amigurumi patterns, that I could close my shop with a little plus by the end of the year. This left me with some unexpected budget, and now guess what I did with the money? Yes, I invested it into a portable and foldable photostudio, which is perfect for the limited space of my tiny crafting room and the bad lighting conditions in winter. 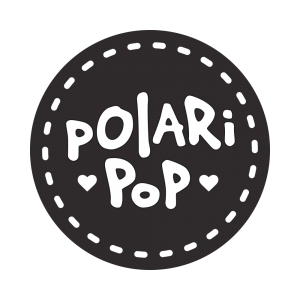 That had been my greatest wish since I turned POLARIPOP into a business, and now I could finally fulfill it, with your help! Back in the days when I was still working as an art director at LimeSoda Interactive Marketing, we often did social media campaigns for our clients. The budgets were small back then, and companies couldn’t or wouldn’t invest into big photo shootings, so we had to do many improvised shootings on our own. It was fun to do, and we had to be quite creative to compete with all the well equiped classical advertising agencies, but to be honest, it was not very effective. Then my workmate became aware of this great kickstarter campaign, held by a young company called Orangemonkie. They invented a tiny foldable photo studio for hobby photographers at a very low price, and we were thrilled to support their Kickstarter campaign. It was great to see this idea they had to come to life only by the support of backers who were dying to have the finished product standing on their table. I guess we were the first ones to preorder the foldio 1 in Austria or even in whole Europe. 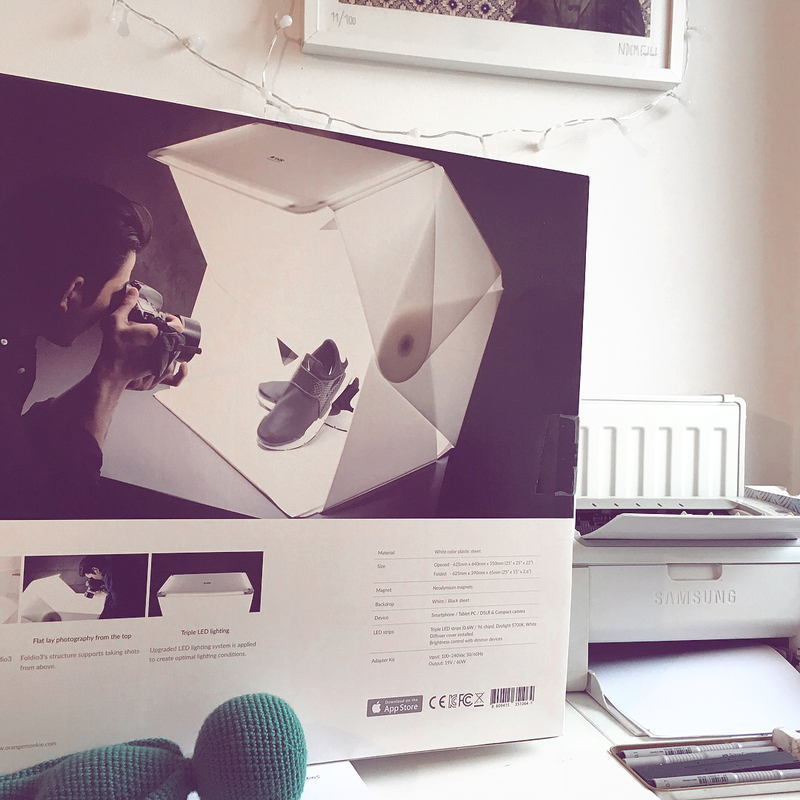 The campaign was successful, and a few months later we held the foldio 1 in our hands. It made our work so much easier, since now we were not forced to take our picuctures at certain times of the day anymore, and we could easily unfold and use it even on our small work desk. Of course some time has passed, and many copied the idea. But Orangemonkie also enhanced their product, and so it came to happen that they just started their 3rd Kickstarter campaign in 2017, and the third version of the studio, foldio 3, was already available by the time I closed my shop. In the picture you can see the development of the foldio portable studio. 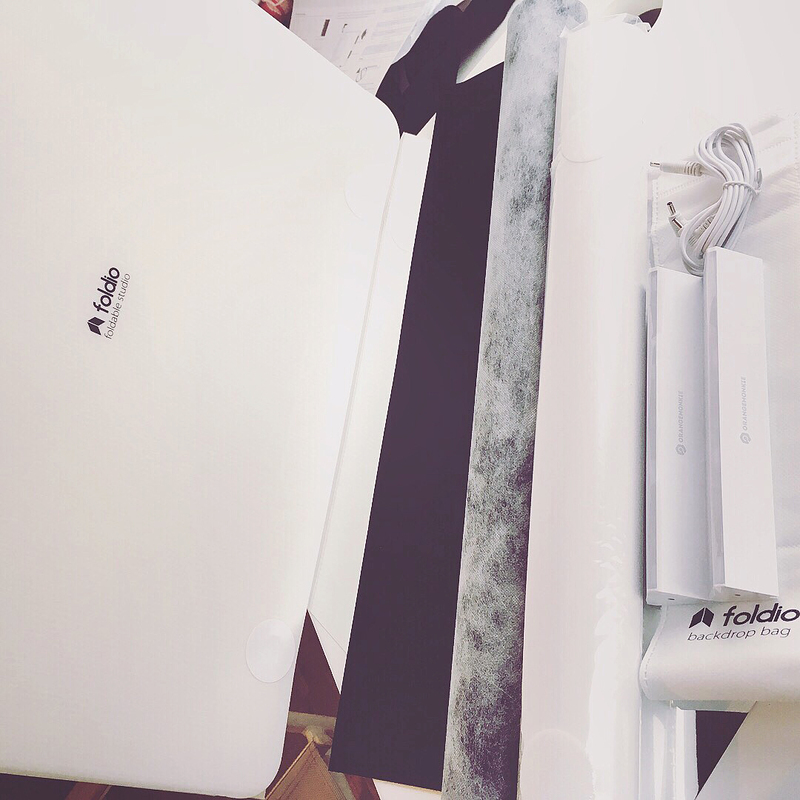 The size increased from 10 to 25 inches with the foldio 3. Well, and this is it. The picture on the back already shows you anything you need to know. 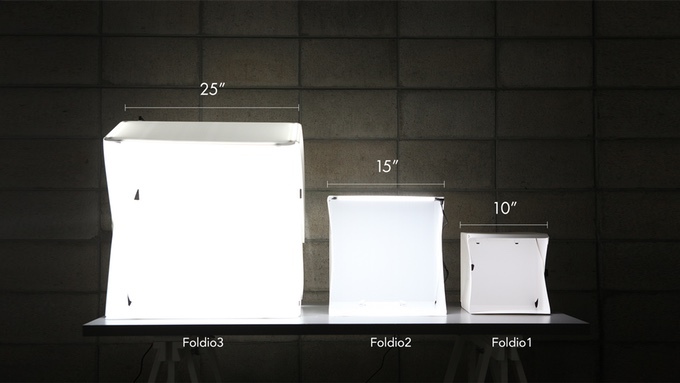 You don’t have to mind lighting conditions, you don’t have to set up a photo shooting environment… everything you need is a small table or chair to place your foldio studio on, and power supply for the LEDs included. I decided to order the additional „halo bars“, which are two extra lights to add to the LEDS. Like the main LEDS, you can also controll the halo bars with a dimming controll included in the standard package. There are 2 backdrops included, a white one made of polypropylene, and a black one made of some kind of velvet material. 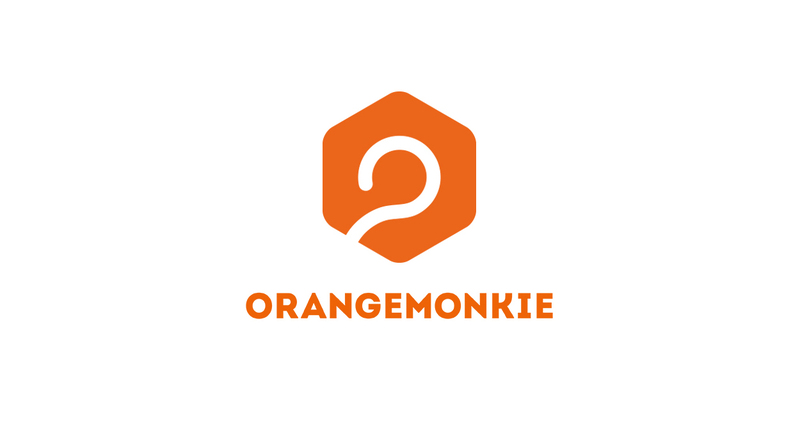 Orangemonkie will even add a lightweight bag to store your backdrops properly. This is how my setup looks for now. Currently I am working in our living room, because Vienna is windy as usual, and the craft room is kind of draughty too… but as soon as I decide to move back there, it takes me less than 2 minutes to fold my studio together, and unfold it in another room. Have you noticed in my patterns‘ many photos, that there are some differences in brightness, shadows and colors? I love natural light, but it is also the reason why pictures taken in the morning will look completely different from these taken in the afternoon. Because of your support, and the foldio 3, this will never happen again! From now on all pictures will have the same lighting conditions, the same setup, the same sharpness. I will be able to make shootings day and night, without having to wait 24 hours between shooting different body parts of an amigurumi for consistent lights and shadows. 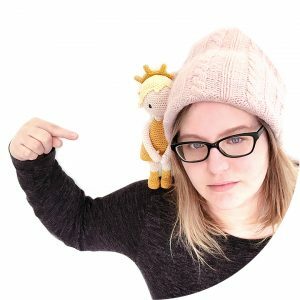 I wanted to let you know, that everything you are investing into me, you are investing into my time and ablility to bring you new and fresh amigurumi designs non-stop. It feels so great to know my creative work is appreciated out there by you. If you are interested in getting your own home photo studio with foldio 3, you can find it here at the Orangemonkie website. This is NOT a sponsored blogpost. I have been a true fan of their product since day 1, and will always be, as long as they keep the quality as high as with my wonderful new tool foldio 3. I already don’t know how I could live without it before. 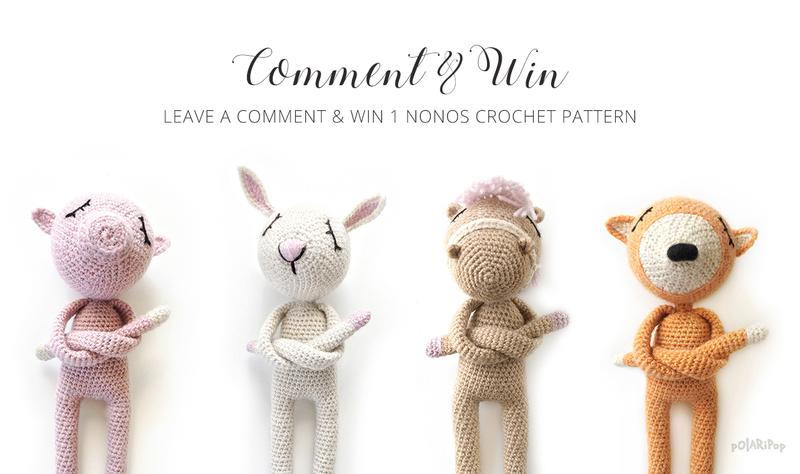 TELL US ABOUT YOUR SETUP AND WIN A NONOS CROCHET PATTERN! I will soon share my experiences with this new gadget here on the blog, as soon as I get used to work with it a little bit. What do you think? If you are selling your crochet toys, are you doing professional photoshoots for your dolls and animals, or do you use daylight only? 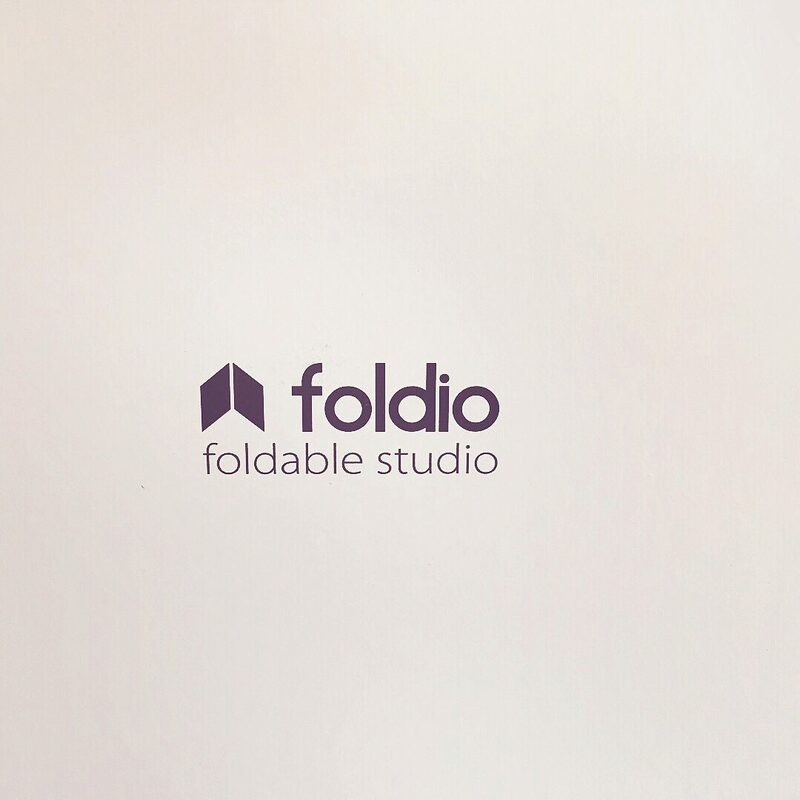 If you are a pattern designer yourself, could this foldable photo studio also improve your workflow? Feel free to share a link to your shop, your blog, or even your Instagram or Facebook account, so we can have a look at your studio setup or your style of product photography. I am curious to see your workspaces and crafting corners, and I’ll be happy to also leave a comment there! Of all people leaving a comment underneath this blogpost until next friday, one winner will be drawn. The winner will be able to choose 1 of the NONOs amigurumi patterns shown above. This is an international giveaway. Winners will be chosen in the evening of friday, february 2nd (CET), and informed here on this page and via email. The winner will be aked to choose ONE of the 4 NONOs patterns shown above. Pattern will be available for download in German & English language. You need to leave your email address when commenting. Your email addresses will NOT be shown here on this page or anywhere else. Of course I will never hand it out to anyone else! Be one of the first 10 commenters, and your comment will count twice! I always use natural light. However it offten causes trouble. Sometimes i never find the perfect light. I read your blog and foldable studio looks very useful. I use natural daylight but some time ago my husband, who is into photography, got a small portable Studio. Great to use when kids are sleeping!! Your work is amazing! Kisses from Buenos Aires,Argentina ! I am not à professionnal but i love to make photos with my iPhone or a camera and would appreciate this portable studio that seems perfect ! I also lové tour Nono and its pattern would please me indeed ! Thank you for tour créativity and kindness ! Hello¡¡¡ ^-^ I only use natural light. The photos of my amigurumis would be much better with foldable photo studio. I use natural daylight all the time! Living in Indonesia where the sun shines all day, with a house full of windows, I think I can get some pretty shots with a good camera. Well, of course it looks inconsistent and unprofessional, but enough to showcase my works 🙂 but the foldio must be a great help while writing patterns! As I usually crochet at night while my kids are asleep, and to get clear and bright pictures for step by step tutorials is kinda hard. So I think it’s going to be a big help in pattern writing! So happy to read about your foldio Studio, súper practico!!! Hello! I use sunlight at home, but I have to check shadows and imperfections in the picture. I usually take the pictures with my camera phone and I use some filters on Instagram. I’m learning every day. Next step will be to buy a portable studio like you, I supposed, but it depends on my personal budget. Ich musste gerade so lachen bei deiner Beschreibung, wie du im Winter Fotos gemacht hast, in dem Zeitfenster von 2 Stunden Tageslicht. Genauso sieht es bei mir auch aus. Allerdings finde ich, dass deine Fotos immer toll und sehr professionell aussehen. Und ich liiiiiebe deine Nonos!!! Ich kann es kaum erwarten, bis es die Anleitungen wieder zu kaufen gibt! I have the same experience. I use natural light and I put my crafts to the top of a short bookshelf or a table, with white cardboads as backgrouns, but this solution is not the best. I have a small fabric light box but it is not good enought, I need external light sources and that’s a problem. Hi Eva, i also have same problem about the light while taking photos for my instagram page, although i live in İzmir where the sun is with us almost the whole year. I am thinking to make an amateur light box by myself. Thanks for the pattern giveaway. You posted. I might invest in one later. During the summer days I use the light of the sun, but in winter I use a luminous ring! I have been used the foldio to take a photo but not good photo. Now, I use natural light with view from my room or take a photo with wood desk at coffee shop. Unfortunately I don’t sell any of my crochet items, and tend to just use my phone to take pictures for personal reference/sharing with family members and/or crochet groups on facebook. I don’t really have a set up. I use regular daylight with no special setup in my backyard. I like our old wood bench for the crochet pieces to lay on. I’m not a designer but would love to take professional photos of my finished work and very much like the great foldio. I have the same experience. With my old camera & sometimes I’m using camera phone, i just had the option to depend on some natural lightning on my craft room & yeah we got the same situation there where it’s the only room in the house hit by sunlight on 2 sides. I’m not a designer yet,maybe someday, hopefully. I’m working on my own pattern now (still trying & learning), & I love both crochet & knitting but I focused more on amigurumi. I also use natural light, and I have a wintergarden with great light also in winter. I usually just use natural sunlight but I love this idea. Can’t wait to try this. You are a great inspiration with the patterns and ideas you share with us. Ich benutze für meine Werke nur normales Tageslicht, bin aber auch keine Designerin und verkaufe auch nicht. My set up is usually a piece of wood from outdoors and natural light outside. I live in Texas so we have a lot of sun which makes it perfect for taking pictures. Plus I live in the woods so trees make an awesome background. Wow! I’m jelous! Mine is 9″ and you can see the box in the pictures! I recently bought a bigger one, but you need to provide the lighting. Now i need to wait till i have better lights! Hello! Great boxes for pictures! I’m not a crochet designer but when I take my creations in picture I use natural light, outside, in my garden. Not very easy when it’s cold or rainy… Thanks for this giveaway! I had the exact same problem with my blog photos and I gave myself a Christmas present too. I bought a similar setting to yours and it’s a game changer!